Advancements in wind power have made energy less expensive. 2. New research in nanostructure-based technology will make it more efficient for energy conversion in photovoltaic solar cells. The nano materials will allow more light to be trapped for future energy. Researchers are using algae to clean up contaminated water. 6. 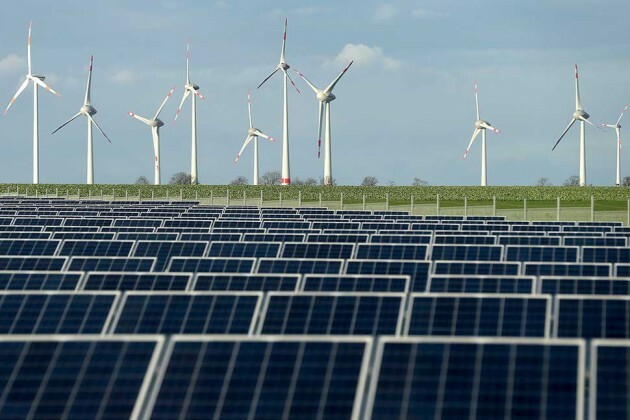 For a twenty-four hour period in 2014, Germany generated almost 75% of its electricity from renewables. Earlier in 2014, renewables produced 27% of the country’s electricity. “Energiewende” for Germany means energy transformation, which has a goal of powering Germany entirely by renewables by 2050. Even though the transition is met by many challenges, the majority of Germany’s population support the change to renewables. 7. Researchers have advanced in the technology of making biofuels from wet farm waste, including corn husks, tomato vines and manure. Dry farm waste, such as wood chips, is much easier to turn into biofuels, as it doesn’t break down on the way to transformation like wet waste. Researchers at the Bio-Renewable Innovation Lab (BRIL) say, “We are taking what is now a net-negative resource in farm waste, which farmers have to pay to remove, and providing an opportunity for them to make money and help the environment.” It’s a win-win partnership! So, onward into 2015! Let’s see what it brings in advancements toward a cleaner planet! Categories: biofuels, Energy Programs, Renewable Resources, Solar, Wind Farms | Tags: megaflow battery, photovoltaic solar cell, Renewable energy, Solar power, Sustainable energy | Permalink. Here is an idea. Put the solar panels below ground but in direct sunlight. Put the wind turbine genarator on the ground or just bellow it. Put another 3 next to it. In the turbine shaft insert a prop. Connect it to a centrafugal gearbox.conect that to a transfer box. In high winds do not stop the blades. Just let tgem turn 4 genarator s. Ive other ideas. Multiple wings. The simplest fuel would be hydrogen – just reduce protons to make hydrogen – but these days people think, of course, of carbon dioxide to help reduce the carbon dioxide and produce a carbon-based fuel like methanol or something.